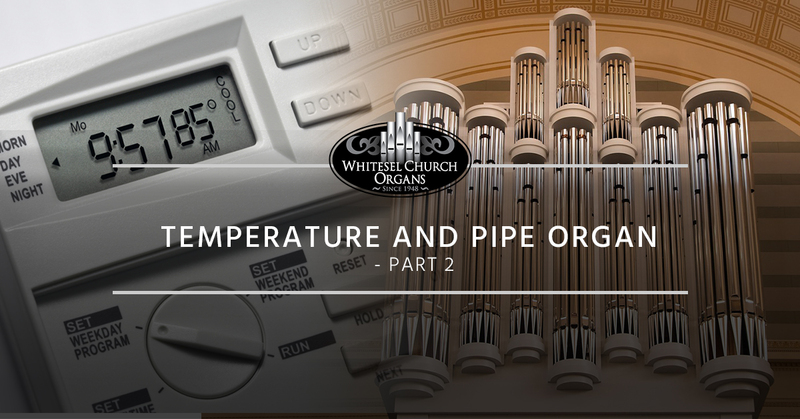 In case you missed our last blog post, we discussed the importance of a regulated and balanced temperature in your pipe organ room. While it might be strange to think that the temperature of a room can alter the entire pitch of a massive instrument, it can! We are here to help you know what to do when it comes to organ tuning and how to best prepare for the tuner to arrive. You can always call Whitesel Church Organs for assistance and tips, as we will be happy to tune your pipe organ for you. Read on to learn more! Some churches have now switched to having thermostat programming, which is wonderful for the comfort of your congregation. However, it does happen where someone will set the thermostat to the proper temperature the night before a tuning in order to keep the organ in the right conditions, but thermostat programming will override that change. This usually isn’t discovered until it’s too late, and we will have to reschedule the tuning. Does the room temperature have to stay constant for the organ? Many people want to know if the organ needs to stay at tuning temperature at all times, or whether they can set the temperature back to the way it was for the sake of efficiency. You will need to speak with your tuner specifically, as they will be able to assess the room and your particular pipe organ to ensure that everything will stay stabilized. To be honest, unless your room goes to the extremes of temperature or humidity, you can set your room temperature to go back to a reasonable interval, as long as you set it back in time for the room to stabilize before a performance or event. In other words, if you tune your organ at 75 degrees, keep it at 65 during the week, and push it back to 70 degrees the day before a service, your organ will be in tune and ready to go come Sunday morning. However, you will also need to keep the effect of humidity in mind, especially in relation to the temperature. Many large parts of the organ are made with wood, which expands as the humidity increases. The wood parts are susceptible to the dry conditions that have come with artificial heating. If the air in your pipe organ room is not humidified in the winter, you should allow the room’s temperature to fall back in order to increase the humidity in the air. Air conditioning is less of an issue when it comes to humidity. The best plan for winter dryness is to find a humidity system that can keep all the air in the room at a balanced level. This will extend the life of your organ, as well as any of musical instruments and wood furniture kept in that space. If you would like to learn more about our tuning services and how we can help you, contact Whitesel Church Organs! We would be happy to come to your New York church and assist you with tuning your pipe organ. If your church is in need of a new organ entirely, we can help with that, too. Reach out today!